If you’re like me, sometimes the best bit about a trip to a museum or gallery is the shop (closely followed by the café). I used to work with a woman who admitted she would visit the shop first, and then make her way to the collections afterwards…priorities! Whether you’re looking for a special gift for an arty friend, or something for yourself, here are some of my top picks of unique art-related gifts for under £30. Bargain! This colouring book has very light lines and elegant designs, allowing you to use pencils, pastels, watercolours or gouache to complete the artworks inside. The 180 gsm drawing paper also means your colouring doesn’t show through and you can even frame/display your artworks afterwards! Great as a gift or for relaxing with on your own at home. 2. Beautiful botanical artist necklace – £25 This statement necklace, made by artist Lucie Ellen, is inspired by a love of houseplants and trips to botanical gardens. It has been made from collaged paper laminated onto beautiful 6mm birch plywood. Each leaf has been cut from hand painted paper. Using different painting techniques on each leaf so the patterns will vary from piece to piece, making each necklace a one off. Leaf position may vary slightly too. Everything is given a good coat of varnish for protection and shine. The pendant hangs on a gunmetal plated chain. The pendant measures 14cm x 6cm x 6mm and hangs on a 36cm chain with a 5cm extender. This cushion cover has different designs on each side. Vic Lee has illustrated the two Tate London buildings, one for the front and one for the back. Each image has an intricate map of London in Vic Lee’s unique style. Vic Lee is a wordsmith, mapmaker and typographer. He has 20 years in professional graphic design under his belt. His work can be seen across London, from interior and retail design to major branding and personal commissions. These beautiful sketchbooks feature William Morris’s iconic wallpaper designs. Unlined and suitable for writing and drawing, they are available in a range of sizes and with different types of paper. Made in the UK, they have been produced exclusively for the William Morris Gallery. 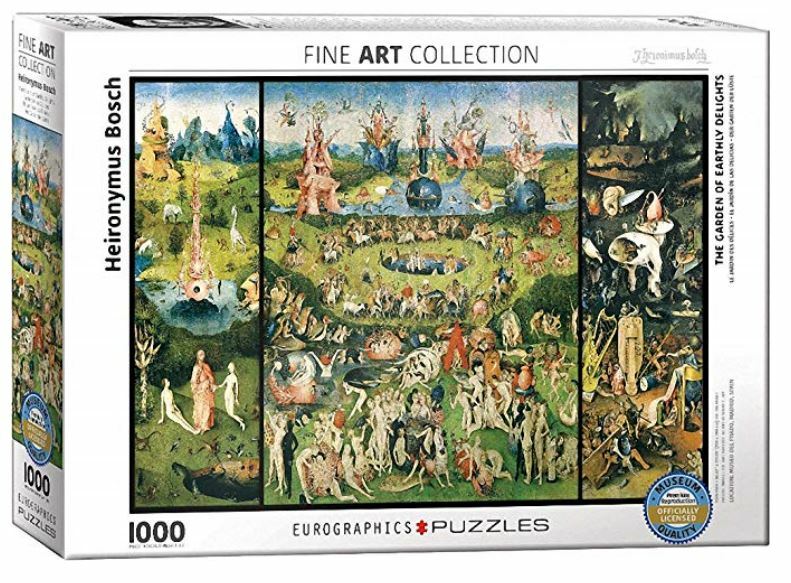 Get stuck into this Garden of Earthly Delights jigsaw, based on Hieronymus Bosch’ famous artwork. One for the family come Christmas time? Meet Andy Sock-Hole, Feetasso, Frida Callus and Vincent Van Toe. These fun and colourful socks are the ideal gift for any art lover, perfect for keeping your feet warm this winter. Available in UK shoe sizes 4 – 8 or 9 – 12. A lovely gift for an art historian. The design is simple and elegant, and the text is subtle. These are a popular choice for a graduation present. Other designs are also available. 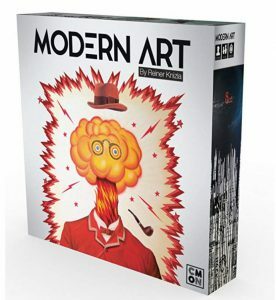 Modern Art is an art auction game. You control a world class museum and hope to make your millions by buying and selling masterpieces of modern art. Over the course of four rounds, each player will get a chance to auction off paintings. The more popular the artist, the more money you can make. You’ll need a cut throat attitude to walk away victorious. This is a great drawing game for adults and children, which a friend recommended to me. “Everyone is drawing one picture together…and one doesn’t even know what they draw. There is a fake artist hiding among the real artists – can you find out who it is? 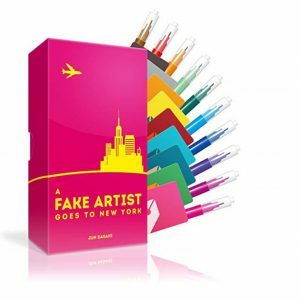 The fake artist has to be careful not to be identified and the real artists have to be careful not to make it too easy for the deceiver”. 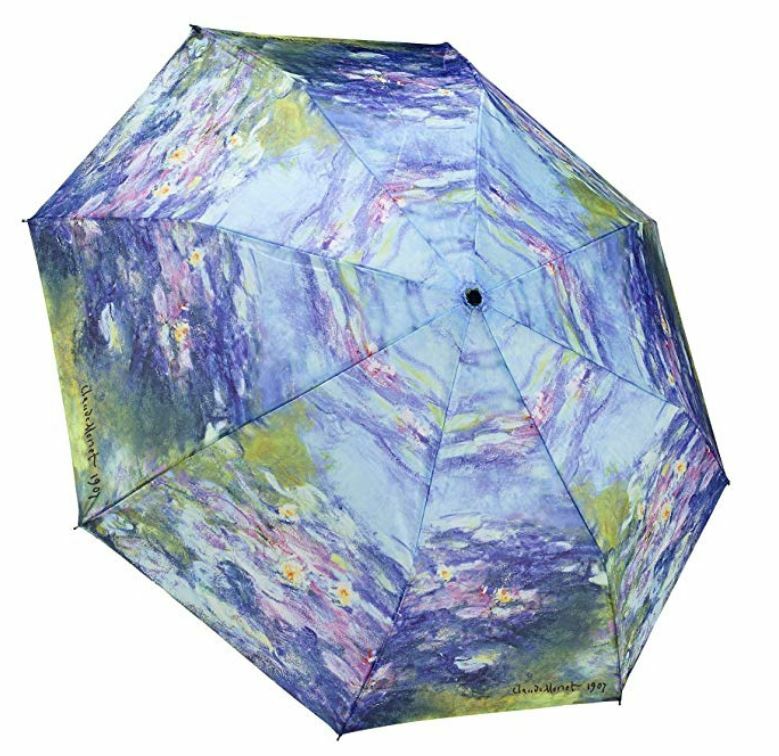 Brighten up the rainiest of days with this beautiful Monet-themed umbrella. Strong, sturdy and Impressionist. Style it out.